I want to know is it possible to recover deleted photos from camera disk or hard disk? As data loss due to accidental deletion of data, formatting of memory card, virus attack, system or disk crash, etc happens, free data recovery software can help you in this scenario. Powerful data recovery software can help. EaseUS Free Data Recovery Wizard is one of the most efficient camera memory card recovery software which performs professionally and efficiently in tackling with how to recover deleted photos from camera memory card or hard disk drives. It works well in dealing with complex data troubles on computers like file lost recovery, formatted recovery and even data recovery from partitions. It also applies to solve data lost cases on various kinds of storage media such as hard drive, hard disk, flash drive, SD card, memory card and so on. Data Recovery Wizard Pro: $69.95:- This software has additional Free Lifetime upgrade, free lifetime technical support. The type of license is Single License. Data Recovery Wizard Pro + WinPE $99.90:- This software version provides users additional bootable media for emergency recovery. It can recover data even when system fails to boot or crashes. Data Recovery Wizard Technician $499.00: In this software users are able to provide technical services to their clients. Type of license is Technician. Step1. 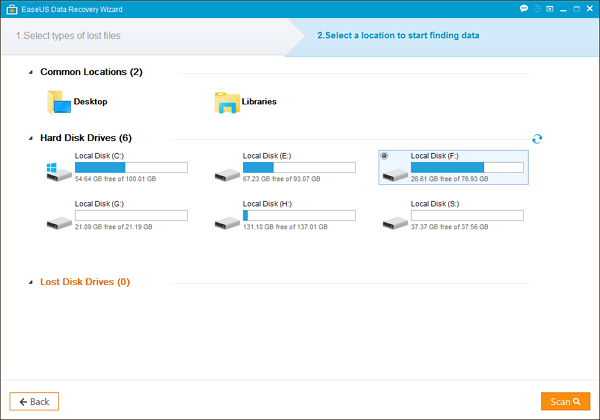 Launch EaseUS Data Recovery Wizard. Select “Graphics” and click “Next” button to start your picture recovery job. Step 2. Select the disk where you lost your data and click “Scan” button, the software will quickly scan the selected disk to find all your lost pictures. Step 3. After scanning, you can preview all the listed recoverable picture files one by one and select out those you want. Then, click “Recover” button to get them back once. Here you should save all the recovered files on another disk to avoid data overwriting. One can be very upset if he or she loses his photos after a long vacation due to some data loss scenarios. To cope up with all such losses EaseUS Data Recovery Wizard is a perfect solution.